When you are cooking in a pan, or when you are baking or roasting foods, what do you normally use? 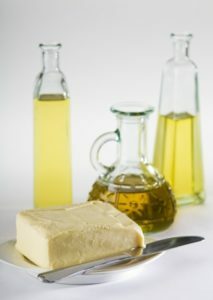 Do you use oil or do you use butter? It is a much healthier option to use oil as opposed to butter because it is essential in your recommended daily intake to use two teaspoons of oil. It can be olive oil, safflower oil, canola oil, or peanut oil. There is another one, but I forgot which one it is. There are five different oils you can use that’s a healthier option for you when it comes to cooking your foods. Butter is not a very healthy food for you to be eating. Even if it’s light butter. I will admit I do use light butter when I am baking, but I don’t use it to roast foods, and I don’t use it to saute vegetables in a pan. So, the next time you decide to do some baking, or to do some roasting, or to do some sauteeing, the better option is to use oil and not butter. Oops! Peanut oil is not one of the daily recommended oils. Please comment and share if you enjoyed Use Oils, Not Butter. Next Post What Is Your Favorite Martial Art Movie?